“I’m a cyclist,” Murali announces. There must have been a few raised eyebrows because he repeats, “Yes, a cyclist,” while making a pedalling motion with his hands. I was sitting in a room full of IT nerds on a Saturday morning. I was there because I had decided that I needed to brush up on my photography skills, so I signed up for a weekend workshop. I was one of only two women, the only foreigner, and the only non-IT professional in the room, apart from Murali the cyclist. Later Murali told me why he had arrived late that morning. The doorman of the mid-range business hotel where the workshop was being held had seen him arrive on his bicycle. He had asked him in an unfriendly tone what he was doing there. Was he looking for a job? “I’ve come for the workshop,” Murali replied. “What kind of workshop?”demanded the doorman. The interrogation continued for another 10 minutes before he was allowed to enter the hotel. “You see, Indians think in terms of status and caste,” he explained. 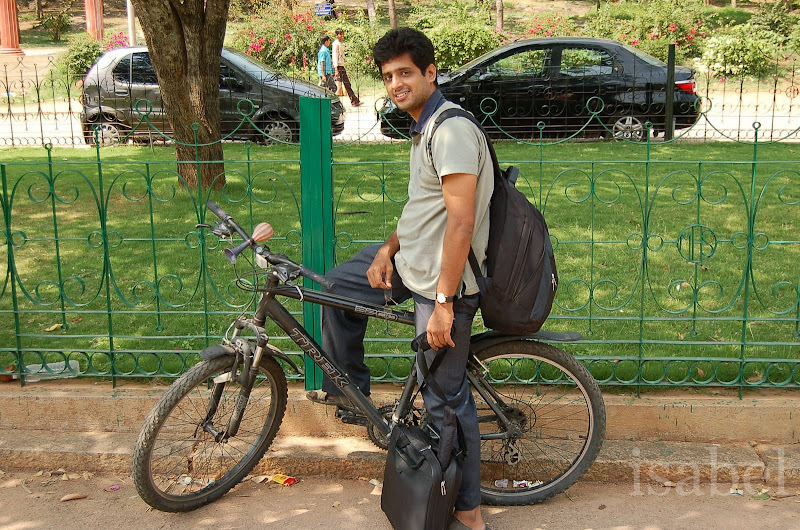 It’s true that Murali’s bicycle contrasted with some of the SUVs the other workshop participants arrived in. A bicycle is not a status symbol. Like Indian society, the roads have their own hierarchy. The bicycle is lowest on the food chain. Trucks and buses rule the road here: they’re the biggest and fiercest and command the right of way merely by their sheer size. Upscale cars and SUVs also somehow manage to impose some kind of authority. Next comes the middle class on their motorcycles and scooters, more vulnerable to the traffic, pollution and weather conditions. Last come the cyclists and pedestrians; endangered species. “Only the poor walk or take the bus,” someone once took the trouble to explain to me. When living in Brussels, I would cycle everywhere. This was the fastest and most pleasant way to get around. I would not dare do this in Bangalore. I find the traffic too intimidating, the pollution too choking and the weather too hot. I often read about fatal accidents involving cyclists in the paper. 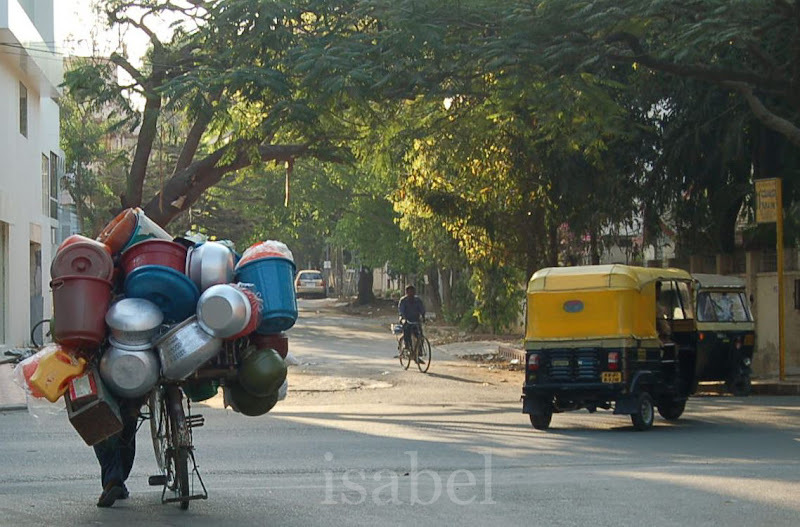 Murali has been riding his bicycle around the streets of Bangalore for the past year. He cycles 5 to 6 kilometres a day. This is out of choice: “Considering the traffic, it’s a fast means of transport,” he tells me. “It’s also a good form of exercise, it’s eco-friendly and a means of self-awareness.” He’s active in a local organisation called RideACycle Foundation which encourages cycling as a mode of transport and a means of recreation. It also lobbies for the rights of cyclists and for laws to protect them. They are currently working with the government administration to promote dedicated cycling lanes. He was inspired to take up this work after a trip to France where he was impressed by the infrastructure available for cyclists. 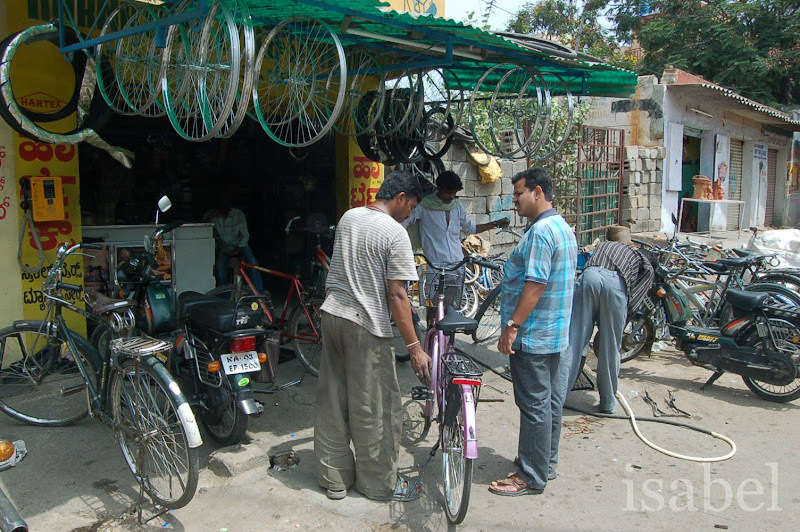 Roadside bicycle repair - while you wait! But Bangalore is still far from a cyclist’s paradise. 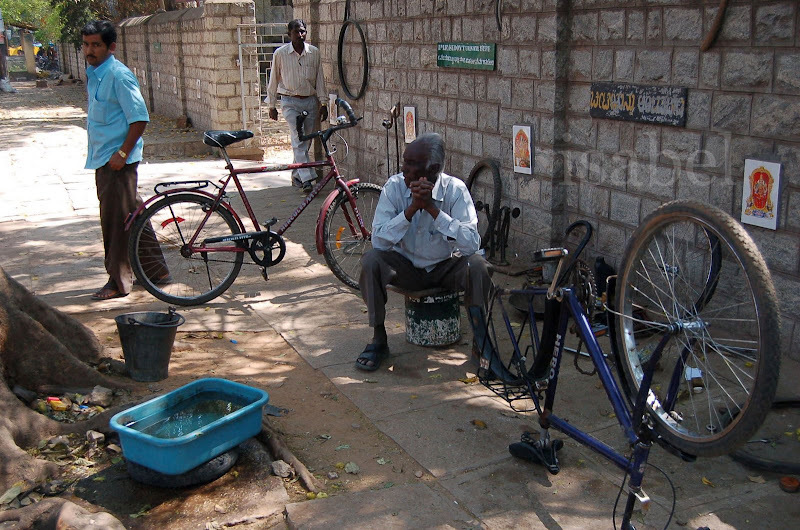 “Roads are not designed with cyclists or pedestrians in mind,” Murali explains. “Look at the Indiranagar flyover. There are no pavements for pedestrians. People have to walk by the side of the road, putting themselves in danger. Motorists have no respect or patience for slow cyclists. Cyclists have to be constantly aware of what’s happening around them, they have to keep their eyes and ears open. This is how I’ve learnt self awareness,” he adds. 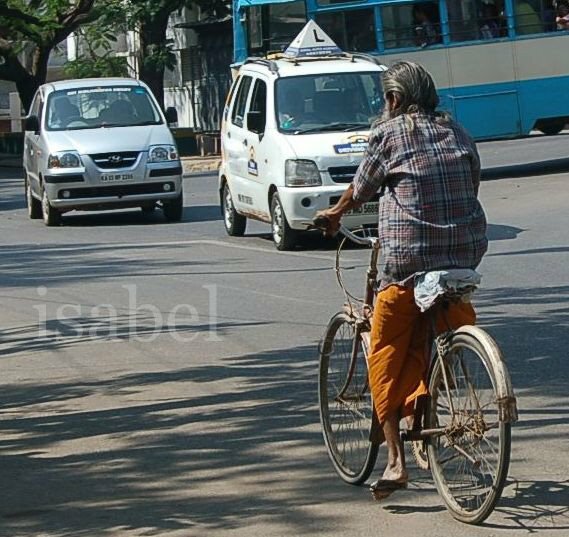 In a city like Bangalore, are cyclists really an endangered species? I hope not. But if there were dedicated cycle lanes, maybe this would encourage more people to take to cycling. Maybe the eco-friendly bicycle will become the status symbol of a new generation. to people.Indians will be more respectful and behave better when the person they are talking to are 6ft tall and big built. this is from my personal experience everywhere in Bangalore. And they think somehow big guys need to be paid more attn to! The ITO bridge in Delhi has a dedicated bicycle lane, but cross the bridge during office hours and you will see scooters and motor cycles in that lane too!